CNC aluminium device which fill the space around HopUp chamber. 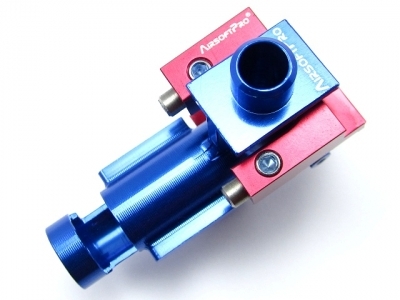 Holds weak front part of the gearbox and prevents againts breaking. 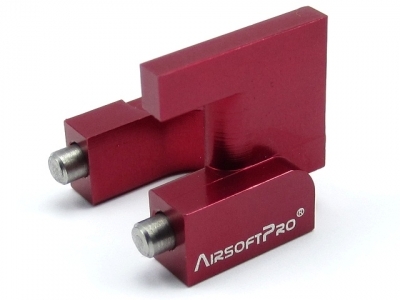 Improved design allows to use on the most common M4 AEG brands, such as AimTop,Matrix, Classic Army, Dboys, A&K, SRC, P&J, A.P.S, G&P. Not suitable for two piece hopup chambers. 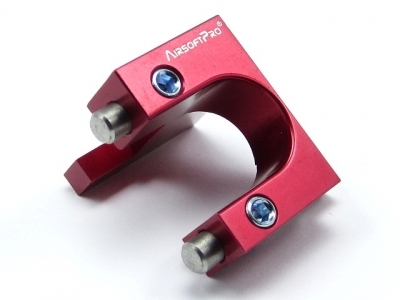 Our MBlock™ is made of very light, but durable aluminium T6 with nice metalic red finish. If you install this device in front wiring AEG, you must route wiring around chamber and around this MBlock. Our previous model or other brands have square corners which may cause wire damage and shortcut. As you can see, we had changed route of the wirings and critical corners were rounded.